What kind of life do factory-farmed turkeys lead before they reach the Thanksgiving table? Our expectations are sometimes out of line with reality, aren’t they? This can be especially true around the holiday season, when, for many of us, visions of joyful family gatherings and magazine-worthy tablescapes can quickly and inelegantly be replaced with the reality of relatives who are arguing about the latest election results or the dispensation of Aunt Ida’s will...kids who won’t pull their faces out of their phones long enough to meaningfully engage...that one cousin who shows up late, eats more than his fair share, doesn’t help with clean-up, or drinks so much holiday cheer that she becomes a little gloomy. We have expectations around our food as well as family. So, it shocked me when I learned that the turkey on my mother’s Thanksgiving table each year had probably been crippled, had spent her life in a warehouse, that she had to be fed a host of drugs just to survive long enough to make it to slaughter, that she had never breathed a breath of fresh air or felt the sun or wind on her back, that she had been mutilated without painkillers in a variety of ways. I cried the first time I saw a baby bird have her beak hacked off with a hot blade, her eyes pinched tightly shut against the pain. And I cried again when I watched a video of workers picking turkeys up by their wings and legs and flinging them like balls into packed cages for a hellish trip to the slaughterhouse, where their nightmarish life would come to a horrific end. I cried because my expectations had been shattered. I heard and smelled and saw the groaning of creation to produce my celebratory meal. I understood my complicity in creation’s suffering, and I wept. Like most people, I thought that animals killed for food needed to be healthy and well-cared-for. I thought that meat came from farmers who had a few animals, cared well for them, and knew them by name. At some point the animals were killed as quickly and reverently as possible by the people who had raised them. It wasn’t a job I wanted, but since I thought we had to eat meat to be healthy, I didn’t question my expectation. Meat and dairy production in today’s developed world isn’t the pastoral endeavor it used to be. Production methods have changed dramatically over the last century. The idea of factory farming didn’t exist before 1926. That year, a woman on the Delmarva Peninsula, just a little south of where I live today, was accidentally shipped a few hundred extra chicks. She kept them inside over the winter, and factory farming was born. Factory farming is simply this: getting the maximum number of animals to market weight in the shortest amount of time in the cheapest way possible. Farmers like Frank are rare...they’re being stomped out of existence by big-ag, by huge multi-national corporations whose sole concern is profit...animals and the earth be damned (not to mention the human workers who are exploited by these profit-driven industries). Because of factory farming and vigorous marketing, the number of turkeys we kill each year in the U.S. has shot up from 70 million in 1960 to 232 million in 2015. This isn’t just an increase in human population: per person consumption of turkey in the United States has gradually increased from 0.8 pounds per person per year in 1910 to more than 16 pounds in 2012. Because of factory farming, we as a nation are eating way more meat, of all kinds, than we ever used to. Christians believe we humans are made in the image of God. We believe that one of our roles on earth is to steward it well, to provide for the flourishing of God’s whole creation. We believe that we are called, in our fullness as humans, to reflect the imago Dei: to show compassion, to be interdependent, to live in mutuality, to pursue justice for the marginalized and vulnerable. And we believe that by failing to do so, we sin against the God in whose image we are made. Does this meal build or fracture relationships? Does this meal demonstrate God’s love in and for the world? Does this meal represent God’s dominion? The reality is that 99% of the turkeys and other animals and animal products available to buy today in the United States don’t meet even a minimum standard of care. Their production fails to provide an affirmative answer to the above questions. 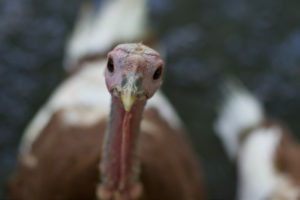 Modern turkey farming abuses birds, wreaks havoc on the environment, and injures humans both physically and psychologically. This Thanksgiving, please consider leaving the Butterball in the grocery store. Reconsider some of non-meat foods of past holidays; add a new recipe to the table. Surely we can celebrate the gifts of life and abundance without abusing God's creatures.